The Intuitive StudioSM suite of modules are designed to provide you, the website owner, with simple to use tools to help you maintain the content on your website. Intuitive StudioSM is different than most Content Management Systems. It's uniqueness lies in the simplicity of maintaining your content, without jepodizing the overall look and feel of your website. Our CMS is individually configured to open up only those areas that need to be maintain, so that your website will always be displayed as it was original designed. Yes, we do offer a WYSIWYG Text Editor for site maintenance, but you will find most of your editing is done through the CMS Modules, so you won't have to worry about formatting your site. All you'll need to focus on are the words and the images. The other main difference with Intuitive StudioSM over other CMSs is that we deliver the solution in multiple layers; content, colors and fonts, logo's and other design elements. Each module is maintained in a similar way, so that you will move intuitively from module to module updating your content. Beyond the consistent management of your information, Intuitive StudioSM also offers you a unique way to present your brand to your users. While the content management is simplistic, your website users will see a unique site that draws them in. So go ahead and take a look at each of the modules displayed on the right. You will see that the content management is consistent across modules. Then let us imagine with you how we can WOW your users with a presentation that is unique and fitting of your business. 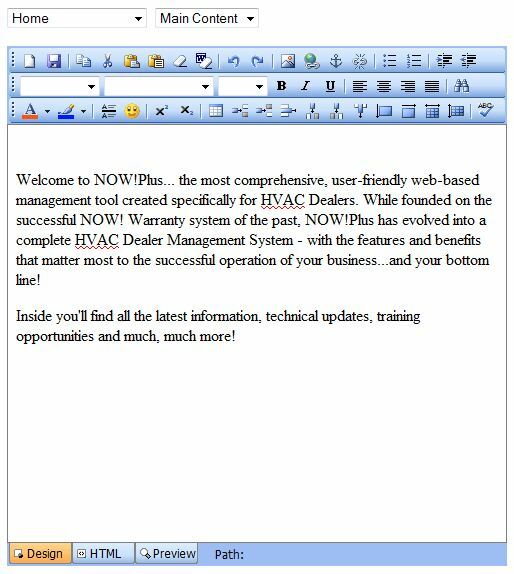 A What You See Is What You Get (WYSIWYG) editor that allows the web site admin to update text on the web site page as if they were using a word processor. This allows the site admin to add columns, headings, pictures and links in a free format method. The News and Announcement module allows you to enter news and information related to your business. The news links can be positioned on a news page as well as featured news re-positioned on another page (home page) for quick navigation for the user. News articles have a start and end date to allow for timely placement of the news. You can maintain: Date / Title / Short Description / Description / Link to more details / A Downloadable Document / option to display on Home Page / Start and End Date to display the news item / Status (display / don’t display). This module will allow you to manage biography information for key employees of your organization. It allows for listing all the biographies on one page or a sub menu on the biographies page to navigate through each of the biographies. You can maintain: the Employee Name / Employment Date / Title / Description / Picture / Email Link / Social Media Links / Start and End Date to display the biography / Status (display / don’t display). The Calendar module allows you to manage events for your organization. These events can be displayed in a list or in a calendar grid. You can also allow the user to opt in for email and text reminders for the event. You can maintain: Category / Event Name / Start Date and Time / End Date and Time / Event Description / Location / Link to more information / Start and End Date to display the calendar item / Status (display / don’t display). The Photo Gallery allows you to put together a collection of photo albums on your web site. There are various ways to present the albums and images to the user. New and innovative methods to display the albums are always being developed. You can maintain: Title / Description / Start and End Date to display the image / Status (display / don’t display). This module will allow you to manage your portfolio of products, projects and/or services. Generally the key navigation components of this module are the images associated with each product, project or service. There are several ways to display the portfolio: image navigation, selection by category, thumbnails to show the different product, project or service, search and several others. You can maintain: Categories, Title, Sub Title (location or other identifying information), Client name and Web site Link, Supporting Vendor and link, Short description, Long description, Unlimited images, Link to testimonial (Testimonial module required) / Start and End Date to display the portfolio item / Status (display / don’t display). The FAQ module allows you to implement a Frequently Asked Questions feature on your web site. This is where you can list common questions that you receive and the typical answer to those questions. You can maintain: Category / Question / Answer / Downloadable document with more detail / Start and End Date to display the FAQ / Status (display / don’t display). The Glossary module allows you to display a list of terms that your users would be interested in knowing the definitions for. The user can access the glossary alphabetically or through a search. You can maintain: Category / Glossary Term / Description / Downloadable document with more detail / Start and End Date to display the glossary term / Status (display / don’t display). The Links module is an easy way to display a list of links that will be beneficial to your users. It can be a list of your clients or useful links on specific topics. You can maintain: Category / Title / Short Description / Description / Image (logo) / Destination URL / Downloadable document with more detail / Start and End Date to display the link / Status (display / don’t display). This module will allow you to manage Banner Images for your site. It allows for uploading an unlimited number of banners along with assigning various banners to individual pages. If more than one banner is assigned to a page, then the banners will rotate to display each banner with a smooth transition between each one. You can maintain: the various banners and which get assigned to each page. This module will allow you to manage the advertisements for your site. It allows for uploading an unlimited number of advertisements. If more than one advertisement is active, then the ads will rotate to display each advertisement. Tracking reports are also available to track Impressions and Click Throughs by day. You can maintain: the various advertisemetns and when they get displayed. Email Blast is a set of features that allows you to send out email marketing blasts to individuals that have opted into your email campaigns. Key features include Opt In / Opt Out, Email Content Creation, Repositioning email content on a web page, Manage Opt In list, Selective sending of emails, tracking email campaigns . The Job Listing Module allows you to display job opportunities in your organization. This allows the user to browse through your openings to find an opportunity that suites them. There is search capability as well as a link to the Job Application form (if that module is installed and you accept job application for the opening). You can maintain: Job Categories / Job Code / Job Date / Title / Description / Required Skills / Required Experience / Required Certifications / Location, option to allow online job application or email address to send in resume / Start and End Date to display the Job Listing / Status (display / don’t display). The Job Application form requires the Job Listing module. This form request generic contact information: (Name, Address, Phone, Email, General Comment Area) and a way to upload a Resume/CSV. A captcha can also be added to eliminate computerized entries. Submitted forms are emailed to your organization and also stored in a database for easy review. This module is a collection of testimonials for your organization. They can be in the form of text or images. There are several ways to present the testimonials on your site. You can maintain: Title, Comment from client, Image of recommendation from client, Client name and Web site link / Client logo / Start and End Date to display the testimony / Status (display / don’t display). This module is a collection of awards that your organization has earned. They can be in the form of text or images. There are several ways to present the testimonials on your site. You can maintain: Title, Comment or Description of award, Date of the award / Image of award, Link to award giver Web site / Award Giver logo / Start and End Date to display the award / Status (display / don’t display). You can maintain: Date, Title, Description, Link to more details, option to display on Home Pate, start and end date, active status. The File Manager allows you to upload files and use them in various Intuitive Studio modules. It is the key to adding files and images to your website.